The picture below was taken by a photographer sometime during Behzad Nabavi's 60 days captivity before he appeared in the mass show trial, see picture on the left. As far as I know the picture below is not published anywhere yet. It was passed on to me by a friend. It is clear from the picture below that Nabavi has suffered a physical beating, the cut above his forehead and his left black eye show a glimpse of what he has had to endure. 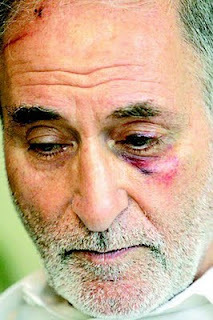 No marks or bruises are visible on Nabavi's face in the official published pictures of the show trial. Whether the photographs are touched up before they are published or Nabavi's wounds have healed up, I can not tell. The picture below however is yet another damning evidence of how the defendants are forced to make the confessions for the court. It is also reported to me that in the middle of the show trial, Nabavi stood up and shouted 'Enough of this farce, end this show here and now' and he was quickly forced to sit down by the security agents in the court. Anonymous is right. 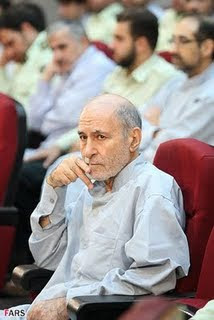 Shed no tears for Nabavi, he was part of teh criminal regime of the mullahs from the beginning. He deserves to get all the beatings coming to him more. LONG LIVE IRAN! DOWN WITH TEH ISLAMIC DICTATORSHIP! I like the line advanced by this blogger which is that at this point all that matters is the defeat of the coup.